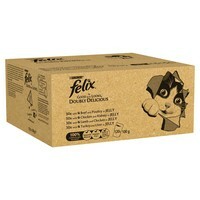 Felix As Good as It Looks Doubly Delicious Adult Cat Food Pouches are a range of delicious, high quality cat food made with two different meaty or fishy varieties in a yummy delicious jelly. Made from high-quality ingredients in a nutritionally balanced recipe, Felix Doubly Delicious contains two meaty duo recipes and two fish duo recipes that combines two exciting ingredients to create a duo of delicious flavours. For an average adult cat (4kg) 3 – 4 pouches per day in at least 2 separate meals. Individual needs vary, and feeding should be adjusted as required to maintain your cat at a lean, healthy body weight.